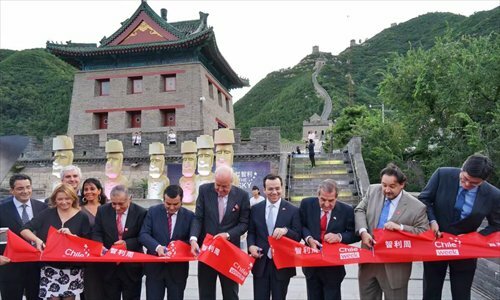 Chile Week got underway with a grand opening ceremony at the Juyongguan Great Wall in Changping district on August 31. It marked the start of a series of seminars, events and shows on September 1 and 2. Chile Week focuses on bridging further bilateral ties on a wide range of issues including investment, agriculture, telecommunication, natural resources, food and drink, culture and tourism. The former Chilean President Eduardo Frei, Minister of Economy, Development and Tourism Luis Felipe Céspedes, Minister of Agriculture Carlos Furche, Vice Minister of Trade Andrés Rebolledo, Undersecretary of Telecommunications Pedro Huichalaf, and the Chilean Ambassador to China Jorge Heine attended the ceremony.